Roasted cabbage is the side dish you have been missing! When you say you are having cabbage with dinner it may not be met with excitement, but that’s because this dish hasn’t been served up yet. It’s one of those that is so simple you wouldn’t believe it tasted so good! 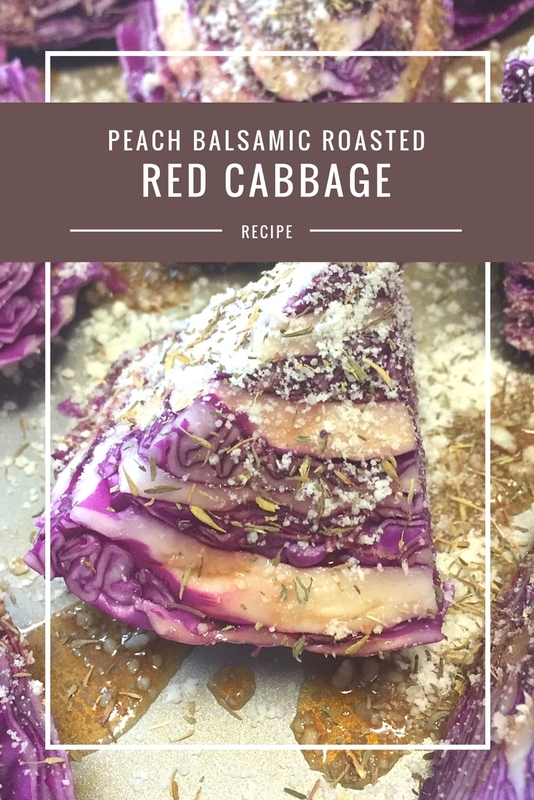 This peach balsamic cabbage with thyme and parmesan is one that I make again and again. 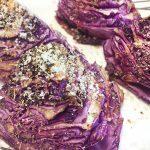 If you need a side dish that is sweet and memorable this roasted red cabbage is quick to put together and a win for the taste buds! All you need is one head of cabbage, some balsamic, then a sprinkle of herb and parmesan. Seriously, that is it. The prep takes less than five minutes! You just cut the red cabbage in half and then quarter each section. Drizzle with the balsamic vinegar and some olive oil. You can add the seasonings now or with the cheese. I absolutely love flavored balsamic vinegars. This peach flavored one is made right here in Texas! Roast at 400 degrees for about 20 minutes. When it has less than 10 minutes left sprinkle with the parmesan cheese and place back in the oven. It’s peachy and slightly cheesy, so it’s sweet and satisfying taste pairs perfectly with a main dish. I will admit that I have often just eaten this roasted cabbage all by itself though! Roasted red cabbage with peach balsamic vinegar, parmesean and thyme. 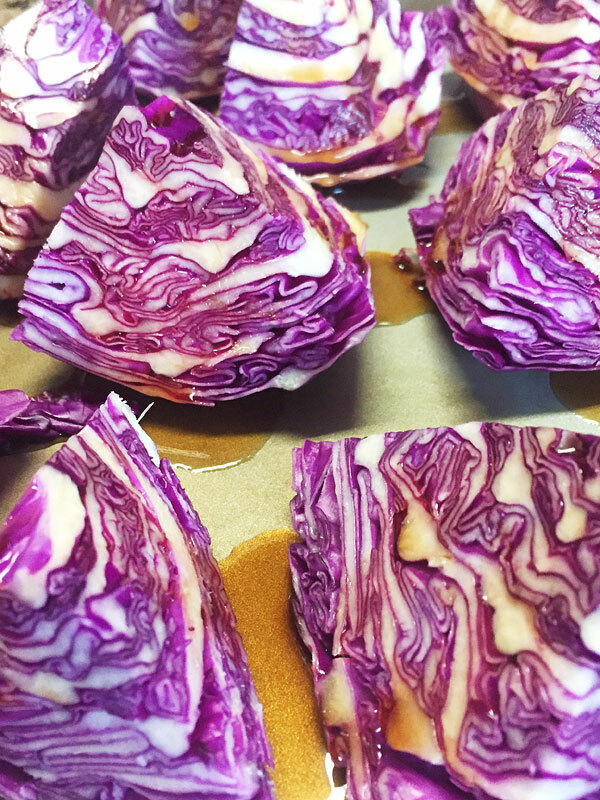 Cut the red cabbage into wedges and drizzle with the balsamic, some olive oil and the seasonings. Roast at 400F for 20 minutes. When it has less than 10 minutes left sprinkle with the parmesan cheese. I’m always trying to come up with meals that can be cooked quickly and with few ingredients, but healthy above all! When you have a busy schedule it helps to know you can throw something together quickly that will still benefit your body. 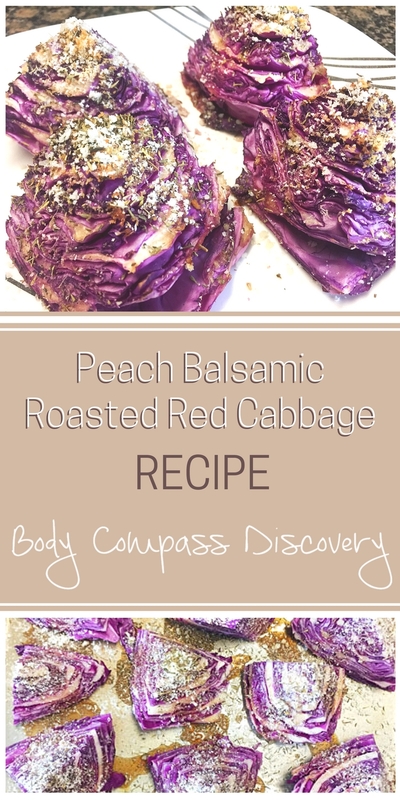 I’ve never been a huge fan of cabbage but those peach roasted red cabbages look delicious! I may have to give cabbage another go! 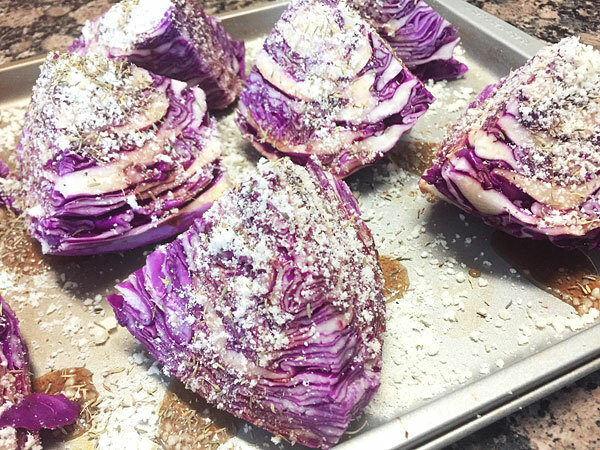 I thought cabbage was just meh until I tried it roasted- totally changed things for me!